It is expected that a business owner will claim home office tax expenses if their small business is run from home. This should be done to reduce the amount of tax that has to be paid. The office or workshop space used needs to be the principal place from which the business is run and it needs to be used regularly. The office or workshop space needs to be used solely for business for claims to be made. If the dining room table is used to do office work and then also used for dinner and where the kids do their homework and where mother does sewing, or any other personal or family activity then this cannot count as office space upon which to claim home expenses. 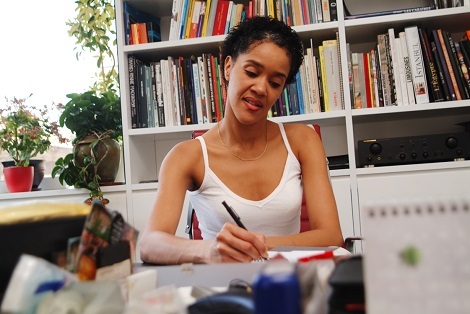 If there is no spare room available the owner should set up a corner of a room that has space as an office, put a small table or desk there and only use it for business activities. Keep a good record of the interest paid towards the home loan so these can be included in the home office calculations. Unfortunately, the principal payments cannot be claimed as these are viewed as capital items, which is the same for ordinary financial loans for a business too. You can claim a portion of whatever rates apply in your area for home owners such as water, sewer, rubbish removal etc. This only applies if the repairs or maintenance are carried out in the specific office area along with the rest of the home. It does not apply to improvements as this is a capital expense (like replacing a roof). The two need to be distinguished carefully. If the repair or maintenance was only done in the specific office space the claim is fully deductible (like repairing an electrical outlet). On the other hand, if the dining room or bedroom had some work done on them but the office is in another part of the house and had no work done on it.. then nothing can be claimed... pretty logical really! This includes heating and lighting. If the business owner lives and works from a rented home as a sole trader they may be able to claim rent. However, if the director of a limited or incorporated business is running the business out of their rented home they may be able to charge the business a portion of rent. This then becomes a deductible business expense for the business and a home office claim for the director on their personal tax return. This is for home and contents insurance only. It does not apply to life insurance which is not counted as a home office tax expense. 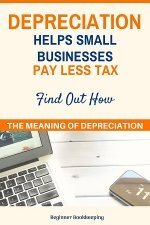 This is for the depreciation on the home and on other capital equipment such as the computer and printer in the office. 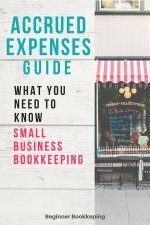 The small business, self-employed person should keep thorough records of all claimable household expenses for the year as per the list above. These details need to be included in the end of year tax calculations or provided to the tax accountant. It is assumed that all of the above bills will have been paid by the owner from their personal funds. If any of them were paid using business funds, read further below how to handle this. Note that only a portion of these is claimable as home office tax expenses and the values depend upon the size of the space used as an office or workshop, see how to calculate the percentage below. 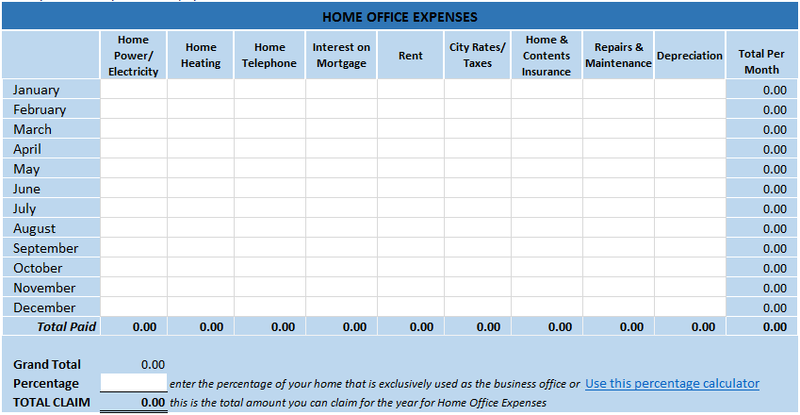 Use the spreadsheet below to track your household expenses and the percentage claimable. Use this spreadsheet in excel to record your monthly bills for the home. There is also a cell in which you can enter the percentage you are allowed to claim, (see further below for details on calculating this). This will give you the final total that you can claim at the end of year to reduce your taxes. Click on the image for the free excel download. This spreadsheet is ideal to use if you paid for the home bills from your personal funds. 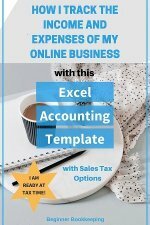 If you used business funds out of the business bank account to pay for any of these expenses, keep two copies of this spreadsheet. One for bills paid from your personal funds, and one for bills paid from the business account (use it like a calculator to get individual amounts for each month, then clear it out to 0.00 before calculating the next month's amounts so that you don't end up doubling up on claims). For the percentage paid from your personal funds, you can bring the total into the business accounts at the end of the financial year with a journal. Debit 'Home Office Expenses' (open this account in your bookkeeping system, it should be listed under 'Expenses' and you should be able to see it on your Profit and Loss report within the 'Expenses' section once it has values against it). Credit Owner's Capital (Funds Introduced) - this account is found on the Balance Sheet. For the percentage paid from your business funds, split each payment out of the business bank account between 'Drawings' and 'Home Office Expenses' - the claimable percentage will be used to calculate the 'home office expense' amount. 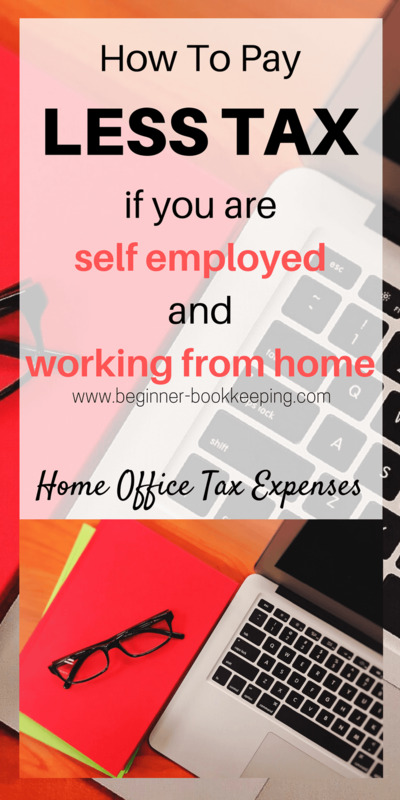 Or, throughout the year put all these payments in your bookkeeping software into Drawings, and then at the end of the year do one journal to split out the 'home office expense' amount (debit Home Office Expenses and credit Drawings (Owner's Draw). The business space is calculated as a percentage of the house. First, measure the room or space which is your office (width and length), and if you also utilize the car port or shed as a workshop - only for the business - measure that too, then add the result to the office amount. You need to come up with the square feet or square meters - here is a calculator for both. Enter your linear measurements into the calculator for the squared result. Second, the whole house needs to be measured to arrive at the square feet or meters. If you own the property you should be able to find the squared measurement from the title deed documents. Result % is the percentage you can multiply against your total bill payments. There may be a threshold on the maximum percentage allowed for claiming home office tax expenses, you will need to check this out with your local tax authorities. Home Telephone Used for Business Calls - A good way of claiming home telephone expenses is to pay the monthly bills using business funds. Then in the bookkeeping system split the personal calls to 'drawings' and code the business calls to 'telephone'. However, this may be a time consuming task every month if there are many calls so it could be simplified by doing the above for just three months and calculating the percentage of business calls. This percentage would then be used on all telephone bills for the rest of the year. To keep the tax man happy if he checks up on things you need to keep copies of these bills handy as proof of how you calculated the percentage. Depending on where you live you may be able to claim 50% of the line rental. Use of Private Vehicle - Well obviously this isn't part of the home, but it is another really good expense to claim. It will be necessary to keep a log of the mileage pertaining to business use. Once again, to keep the tax man happy, a very good record needs to be maintained. This means recording the date, the place started from and the place going to; the odometer reading at the start of the trip, the odometer reading at the end of the trip, the total distance for that trip and the reason for the trip. (Pre-printed log books are available from stationery outlets or a ruled school exercise book will suffice). Once again, you could do this for three months, calculate the total business mileage and multiply that by the tax department mileage rates, and apply this to the rest of the year. A sole trader who has a small number of business transactions may forgo using an accountant to prepare end of year accounts and taxation. They may prepare their own tax returns based on their bookkeeping information utilizing the list of deductible business expenses, and they will have to calculate their home usage as discussed above. There will be tax forms to complete to show these home expenses along with the business ones. Below are some excellent resources about home office tax expenses. Just click on the one that relates to the country you are in - it will take you directly to the relevant tax department for that country. We have only listed the top countries that use this website. If you need to find your country just do an internet search using the phrase "self-employed home office expenses [name of country]".